Children up to 10 yrs old are not allowed in Lodge Rooms. Reservations canceled within 14 days of the scheduled arrival date are subject to a 50% cancellation penalty. A magical place in a magical setting, Areias do Seixo is a natural haven less than one hour from Lisbon. This is a special place where pine trees, dunes and sea murmur their secrets. Experience originality, sublime comfort and an unerring sense of style that seamlessly blends in with the natural surroundings of the land, the sea and the shore. The five GOLD Rooms transport you to a secret world of color, texture and sensation, with the dunes and the sea as backdrop. With their seductive decor, the rooms are bathed in an ethereal glow that touches the Soul and stimulates the senses. Common features include: log fireplaces, bathtubs, rainfall showers and wooden terraces where, with the garden at your feet, you can enjoy the stunning sunsets or look up and wait for the arrival of the stars. The Rooms do not have air-conditioning. Following the sustainability policy, there is an alternative heating and cooling system. Therefore, the acclimatization system uses geothermal energy, to heat and cool the floors, taking advantage of the Earth’s internal temperature. As it is a passive acclimatization solution, its efficiency is not instant, reason why there are always have fresh air fans available to place in the rooms. A room called Jasmine—here you will find Love, Beauty and Simplicity. The Jasmine room does not have a sea view, but instead looks out onto a small private garden with olive trees and, every morning, a stunning new sunrise. This is a room that will take your breath away—surprising and irresistible! At Areias do Seixo, each guests is offered a different journey through the senses in each of the four Love Rooms. Their individual stories unfold enhanced by the smells, the vision and the colors that frame their spaces. Each one of them takes you to a different world. Their common elements include fireplaces, Jacuzzi and unique vistas of the sea and the dunes. The Love Rooms have private terraces. In the Oxalá Room, you can breathe in the colors of fire and sea, inspired by North Africa. From your terrace at nightfall, you can watch the magnificent fiery hues of sunset merge with those of the dancing bonfire. In Ouro and Mi Ma Bô, luxuriate in the Jacuzzi by starlight or, in Nha Cretcheu, experience the sublime rainfall shower. This last room also contains a sumptuous sunken bath for two. 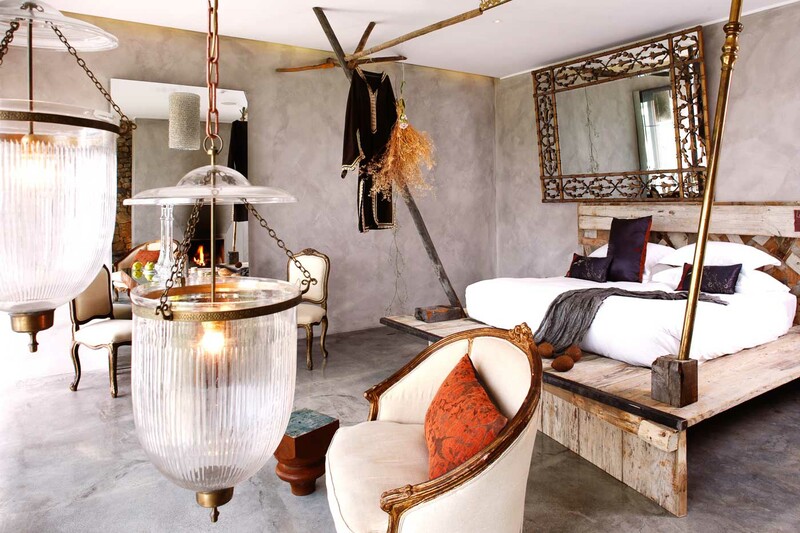 African inspirations and ethnic and recycled elements are the underlying design theme in the four Tree Rooms. Set off on a journey of discovery of woods and construction materials repurposed from work in the hotel, lamps and bedspreads from grandparents' houses, refurbished steel drums and decorative pieces from Morocco. The rustic and the sophisticated intermingle. The charms of each room appeal to all of your senses. Once inside, a feeling of stylish tranquility embraces you! Outside is a wooden terrace with an uninterrupted view of ocean and dunes, soaked in marine light. Common features include log fireplaces, rainfall showers and sumptuous bathtubs with Jacuzzi. On a trip filled with Smells, Tastes, and Colors, the EARTH awaits to give us ALL of its LOVE. The restaurant functions by reservation, open from 1:00 PM to 3:30 PM for lunch and from 7:30 PM to 10:30 PM for dinner. Reservations can be made daily until 10:00 AM. To make a reservation please call +351261936350 or send an e-mail specifying the number of people, time and a phone contact.